The application of Polyamide-Imide top coat over Polyester / Polyester-imide base coat, is well known to the user industry. The Polyamide-imide is class 200+ insulation which gives added thermal properties and chemical resistance to the substrate base coat. However, for certain applications the thermal, mechanical and dielectric properties are highly demanding. A typical example is in the automotive industry where the reliability of components is the crucial factor. 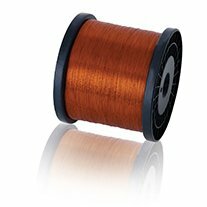 The development of sole coat Polyamide-imide (PAI or AIW) wires, have cutting edge advantages over previous dual coated class 200 wires. AIW Enameled wires are mainly used in automobile industry in various component coils. The insulation is capable of withstanding harsh environments like extreme temperatures, chemicals, oils, greases, mechanical stresses and vibrations. The insulation thickness grade can be selected as grade 1, 2 and 3 depending upon the component design and slot filling factor.